As a structural engineer, the ability to model fast is crucial to your work efficiency. Therefore it’s very important that the tools you use are helping you model quickly and effectively. After all, your time is the most valuable resource: the faster you model, the more you can accomplish. With SkyCiv Structural 3D Analysis Software, a number of great features are built in to help you achieve a faster modelling workflow. We have broken this into three segments: modelling, editing and reviewing. If your structure is symmetrical or repetitive, you don’t need to repeat the same actions anymore. With SkyCiv, you can repeat and mirror parts of your model within just a few clicks. Choose the structure you want to repeat, then go to the Advanced > Operations > Repeat/Mirror, choose the direction as well as the number of the repetitions you want. A beautifully built, symmetrical model is accomplished. Model like SketchUp with a simple pen tool to drop nodes and connect members in a single step. Snap to global grids, and align your nodes quickly and easily - no more trying to calculate node locations - just snap and click! Simply click the pen tool on the right menu to get started with this new, easier way to model! SkyCiv has a number of quick and easy right click functions that will help you model, modify and apply loads quicker. Take our split member function for instance. Select (one or more) members and split them with a single click. You can split by number of segments, percentage and by intersecting nodes. Models can get pretty complicated, pretty quickly. SkyCiv’s Visibility settings (the “eye” icon) make it easy to turn on and off elements and parts of your model. Through the right menu you can control visibility settings on your loads, members, plates and meshes. You can also right click elements (such as members, nodes and loads) and hide/show to focus your attention on a particular part of the model. Research has already shown that “multitasking” can kill your efficiency, so let’s focus on one thing at a time. Then simply open up the left menu for what you want to change, and commit your changes! Having a second set of eyes on your model is never a bad thing. SkyCiv’s Repair Model functionality allows you to run a quick check on your model to make sure everything is ok. Even the simplest of issues in your model can cause incorrect results and unreliable designs. 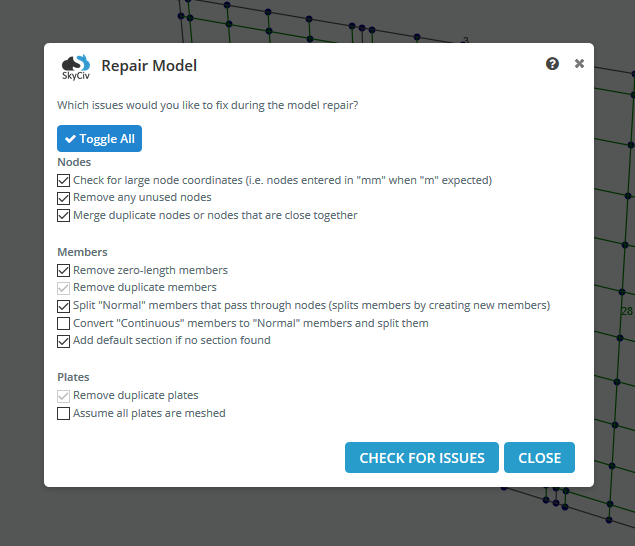 SkyCiv Repair Model will scan your model and identify issues in your model such as duplicate members, disconnected nodes and unit issues. Having difficulty locating where the maximum values exist in the model? The Results Settings (Limit States) allow you to quickly locate where and what values the maximum values occur. How do you know? The graphs will turn red as opposed to the default blue graph color. When you do a screenshot it automatically saves to the Camera Roll (the right bar on the screen). 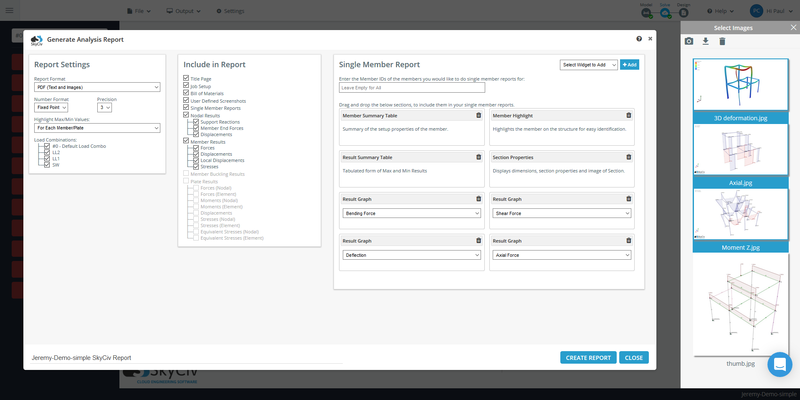 Then when generating a report in the Analysis Report Builder, you can add these custom screenshots to your report. Hope you find this guide of our Structural 3D Analysis Software helpful! For more features and functionalities, check out our Structural 3D documentation for more detailed guides. We hope you enjoy these quick tips on how to model easier and faster.